Open the oven door to this Electrolux electric range and find a glowing blue interior, which adds a stylishly colorful touch to this top-performing model. The smoothtop is simple to clean with a special formula and has expandable elements that maximize your heat use. The oven is stunningly large and has convenient convection baking and an additional warming drawer to keep dishes the right temperature before serving. 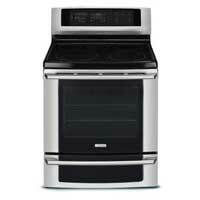 For $1,999, you get a lot of cooking value in a visually appealing range.